Aimed at nurturing compassionate future leaders for the betterment of society, the Hong Kong Jockey Club (HKJC) Scholarships has supported students in their pursuit of their dreams since 1998. 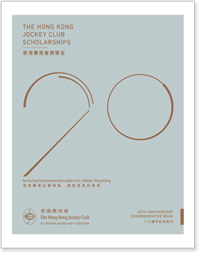 To mark the 20th anniversary of the Scholarship, past Jockey Club (JC) Scholars from HKU shared with us their personal stories and recent developments. Though they are from seemingly unrelated professions, they all share a common commitment, that of contributing to society. Dr Law Ka-Ho (BSc 2003), a Mathematics lecturer at the University, is passionate about coaching the Hong Kong Team for the International Mathematics Olympiad. He hopes to help students find their own path in life as education for gifted children was not popular back during his time as a student. Michelle Liu (BEcon&Fin 2013) and Elvis Ngai (BBA (IBGM) Year 3) were both students of Dr Law at HKU. As an investment banker, Michelle wants to acquire capital for start-ups, and increase entrepreneurial opportunities for students in the field of innovation and technology. Elvis, who is skilled at equipping social services organisations with business strategies, recently launched an online career platform to help students map their future. Entering the law profession at different times, Cora Chan (LLB 2005, PCLL 2006) and Brian Fan (BA&LLB 2017) are united by their identity as JC Scholars and by their enthusiasm for legal work. Now teaching at the Law Faculty at HKU, Cora is the only non-British awardee of the Society of Legal Scholars Best Paper Prize. Further deepening their mentor-mentee relationship, she invited Brian to be her research assistant. Both law professionals are hoping to contribute to the long-term development of the legal system of Hong Kong. This year, five HKU students received an HKJC Scholarship in recognition of their academic excellence and commitment to service. It is hoped that future JC Scholars will join hands with these outstanding alumni to form a force of good and create a better future for all.